Thousands of babies and toddlers are being given two doses of the MMR jab in three months under “emergency” measures to tackle the biggest outbreak of measles for decades. The unprecedented step follows a growing epidemic of the potentially fatal disease caused after too few children were given MMR injections. Around 40 per cent of parents in some areas are shunning MMR, which has faced controversy over suspected links to autism and bowel disease. In South-East London, doctors have seen a record 226 cases in the first five months of the year – compared with 167 in the area during the whole of 2007. Experts fear last year’s record of 1,000 infections nationally is certain to be broken, putting children’s health at risk. Government advisers from the Joint Committee on Vaccination and Immunisation warn the epidemic could spread across the UK and urgent measures are needed to halt the disease in its tracks. Two doses of MMR close together have been shown to boost protection to almost 100 per cent. But children whose parents shun the jab are still vulnerable. Campaigners fear that giving two doses of the triple vaccine over a short period could “overload” infants’ immune systems. But medical experts dismiss this. MMR contains live viruses to provoke an immune response against measles, mumps and rubella. GPs normally give the first dose at around 14 months and the second before children start school, at around four. The second dose is needed because 10 per cent of children fail to get immunity to measles from the first. The second dose should “mop up” all but one per cent of them. There were fears that MMR could cause a form of autism and bowel disease. But this has been rejected by respected scientists, Government experts and all the Royal Colleges. However, concerns persist and experts say these have combined with a traditionally low uptake among itinerant and some religious communities, which has allowed the disease to flourish in the capital. Doctors say the emergency vaccination measure follows Government scientific advice on boosting immunity and is needed to prevent children suffering serious complications. These can include pneumonia, ear infections and, in rare cases, nerve damage which is invariably fatal later in life. Sufferers are mostly children under five. Dr Rachel Heathcock, consultant in communicable disease control for the Government’s Health Protection Agency, said: “MMR vaccination uptake is not high enough to prevent measles cases. “We are encouraging parents in South East London to give the second MMR three months after the first dose to protect their children. We are trying to cover tens of thousands of young children. “If measles spreads then this measure could be introduced more widely and nationally. “Measles is a very infectious disease and it spreads quickly. “It started in North London last year and then came to Lewisham. It has spread next door to Lambeth and Southwark. The hotspot seems to be London, but people travel and if someone picks it up here they could take it elsewhere. The number of measles cases in England and Wales hit 971 last year, the highest since records began in 1995. Around 300 were in North London. At least 95 per cent of children need to have the MMR to create a “herd immunity” that stops the disease spreading. But latest official figures show only 83 per cent of two-year-olds nationally have the first dose of MMR. In London the figure is 71 per cent and in Lewisham, South London, only 58 per cent have the jab. At five, nearly 87 per cent of children nationally have had their first dose of MMR and 73 per cent have had the second. But in London, just 50 per cent have the second dose. In Newham, East London, and Islington, North London, under a third have it. Vaccination rates are also low elsewhere, such as 79 per cent in Knowsley, Merseyside. 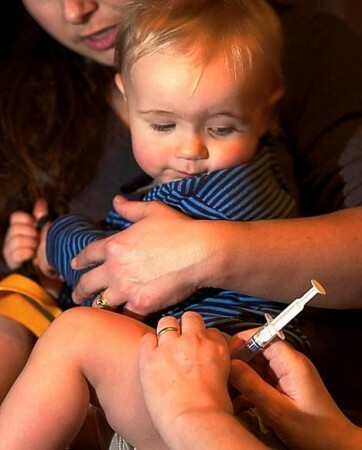 The Government has refused to make single measles vaccines available as an alternative for worried parents. Dr Richard Halvorsen, who runs the Babyjabs clinic for single and low combinations of childhood immunisations, said: “It is a matter of concern to give so many live vaccines to babies so close together. “It might be better to separate live vaccines and have a gap of at least several months.